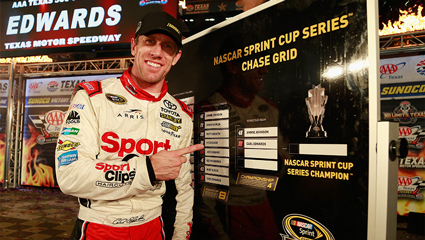 Carl Edwards' #Win Locks Up Berth in The Chase Carl Edwards secured a waterlogged victory Sunday night at Texas Motor Speedway, taking control late in a rain-shortened AAA Texas 500 to clinch a shot at his first Sprint Cup Series title in the NASCAR season finale. Over the last 14 years, Carl Edwards has had a storied NASCAR career moving his way from the Camping World Truck Series through the XFINITY Series and into NASCAR’s Sprint Cup Series. Along the way, he has captured two XFINITY Series Championships and placed himself in elite company ranking fourth all-time with 38 XFINITY Series wins. He also won the coveted Sprint All-Star race in 2011. Edwards completed his first year with Joe Gibbs Racing (JGR) in 2015 driving the No. 19 Toyota Camry in the Sprint Cup Series. He finished the year by qualifying for his ninth Sprint Cup Series Chase. He scored two wins for Toyota and JGR, celebrating victories in two of NASCAR’s crown jewels, the Coca-Cola 600 and the Southern 500. His impressive resume in NASCAR’s top Series now includes 25 Sprint Cup victories, 115 top fives, 202 top10’s, and 16 poles. 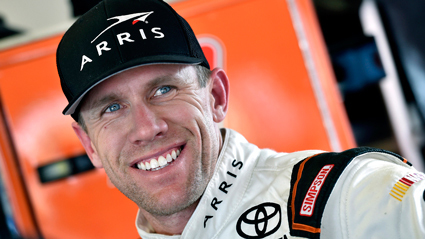 In the first 10 years of his career, Carl Edwards accumulated two NASCAR-sanctioned track championships, three Rookie-of-the-Year honors, and over 75 feature wins while racing on both dirt and pavement tracks across the country. The drive and determination that Edwards showed in those 10 years launched him into a successful NASCAR career that continues into 2016. When he’s not on-track, Edwards enjoys the outdoors, fitness and farming. He is also passionate about his philanthropic activities which include working with Speedway Children’s Charities. For last night's important victory, Edwards' Joe Gibbs Racing No. 19 Toyota permanently took the lead in the 258th of 293 laps, a figure shortened from the original 334-lap distance by an evening rain shower. He benefited from an ultra-fast final pit stop and led 36 laps in his third NASCAR Sprint Cup Series victory of the season, the 28th of his career and his fourth on the 1.5-mile Fort Worth track. Edwards' victory locked up an automatic berth in the Chase for the NASCAR Sprint Cup playoffs' Championship 4 finale Nov. 20 at Homestead-Miami Speedway. Jimmie Johnson -- the Martinsville winner last weekend -- is the only other driver among the eight remaining Chase hopefuls who has clinched a title shot. Edwards is considered one of NASCAR’s top drivers and is among the most respected, recognized and strongest competitors. He nearly claimed his first Sprint Cup championship in 2011, tying for first in points, but losing in the tiebreaker based on number of wins. Growing up in Missouri, Edwards began his racing career in 1994 at the age of 15 driving four-cylinder cars and winning four feature races on the tracks around Missouri and Illinois in the four-cylinder series. On a personal note, NASCAR Race Mom met Carl a couple of years ago at Auto Club Speedway and frankly he is not one of my favorite drivers. In fairness, I was the last of a media hot lap session and Edwards was probably tired . . . bored? However, the fact that he refused to answer my questions nor even turn around as he sat in the driver's seat for a photo quickly lost him myself as a fan. Nevertheless, NASCAR Race Mom congratulates this talented driver on this huge win.